I had some reading to do this week, so rather than stay at home to do it – with all the consequent risks of coffee, biscuit and chocolate consumption, I decided to take myself off into Aberystwyth, sit in the van, and do it there. It was one of the many recent showery days and I thought there might be a chance – just a teeny chance – that sun and shower might conspire to produce a rainbow, and that I might be in the right place at the right time. As an additional incentive, there was the possibility of finding migratory seabirds blown onshore by recent winds. In particular, I was keen to see a grey phalarope – one of which species had been seen in a ditch behind Tan-y-bwlch beach a few days earlier. During the breeding season male phalaropes incubate eggs and care for the young, while females then seek another male with whom to have more offspring. 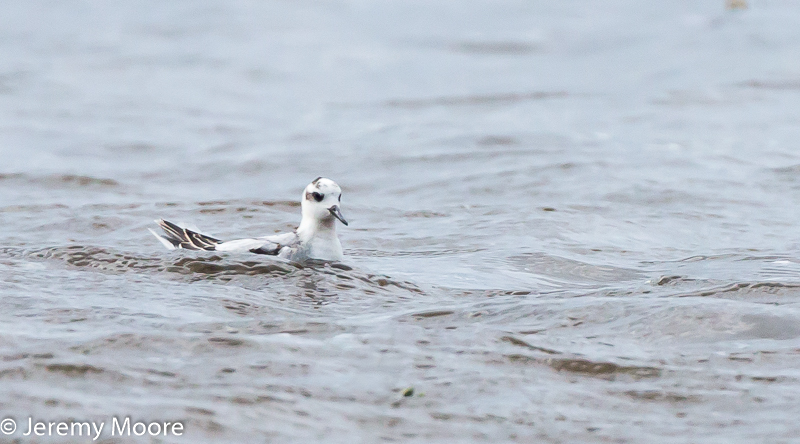 Any phalarope seen here, however, will be on migration; but even then they are a rare visitor. Parking by the harbour I took a walk along said beach, had a look at the ditch and saw nothing. No surprise there then……. I decided to wait in the van and scan the harbour for new bird arrivals every so often while I read. If the sun emerged I could walk out along the concrete jetty for a more open vista. The afternoon passed uneventfully; several times it looked there might be a rainbow but my optimism was misplaced. By about 5 pm I had had enough and scanned the birds in the harbour again before I headed off. Some black-headed gulls had flown in and…..oh….what was that tiny white and grey bird on the edge of the flock? A little gull? No, it was a grey phalarope! For once, I felt, my luck was in. I must have had a huge grin on my face. I grabbed my long lens and rushed round to photograph this scarce visitor. As I crossed a narrow gravel beach towards it I looked up and to my surprise ALL the birds had gone! At that moment a yell of “You did that!” came from a woman on the road with binoculars. She was right. Phalaropes are well-known for their approachability but the gulls must have been spooked and the phalarope went with them. I was crest-fallen and climbed back up to apologise for my clumsiness. Fortunately the phalarope did not go far and was soon back on exactly the same stretch of water. I had another go at a closer approach but it was very skittish. In between flights I got a few reasonable photographs of the bird before it got too dark. During the evening I posted the sighting (with picture) on the Ceredigion Bird Blog. The next evening I had a phone call from one of the most experienced local birders – a chap called Chris Bird (really…) . He wanted to know more about the phalarope sighting. Not that he doubted my word : the photograph was conclusive. No, he had been on the other side of the harbour at exactly the same time and hadn’t seen the phalarope. He had spent some time that afternoon carefully searching amongst all the boats in the inner harbour for a phalarope. During the mini-drama of my attempt to get a photograph of the phalarope he was talking to another wildlife photographer about phalaropes. I couldn’t help smiling to myself. It cannot be denied that there is an element of competitiveness involved in birding, and it would normally be me who was looking the other way when the rare bird flew past. To follow Tales from Wild Wales, scroll to the bottom and click Follow. 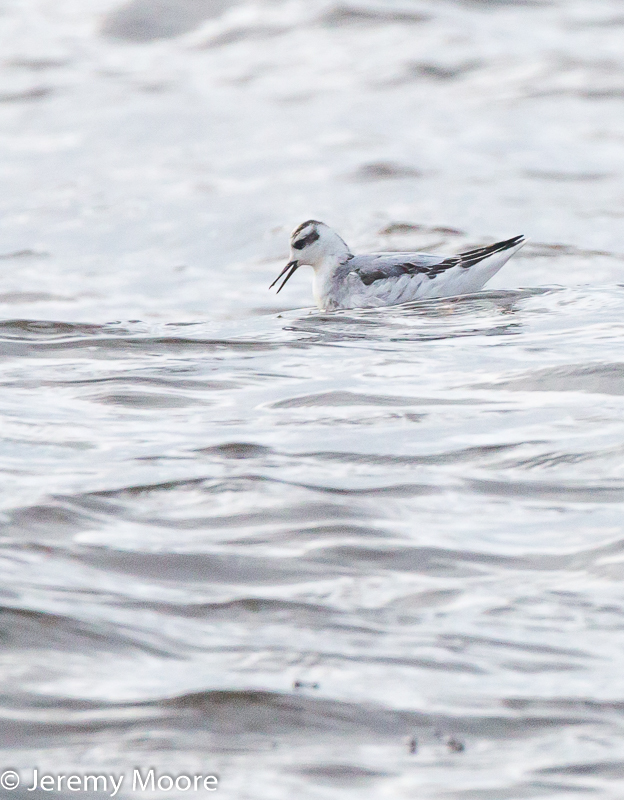 This entry was posted in Uncategorized and tagged aberystwyth, bird, grey, phalarope, photography. Bookmark the permalink. At last I can compete ……. I remember seeing a flock of around 12 grey phalaropes blown in on a gale, doing their classic thing in the surf off TanyBwlch. No shots to prove it alas. Wonder if there’s a race memory brings them back to the same place, or just it’s the neck of the funnel of Cardigan Bay? There’s no answer to that! After discussing “my” phalarope Chris Bird then went on to tell me how many he’d seen and where. Oh, there was four at Ynyslas flying down the estuary….. etc……. Well I can’t compete – I’d never even heard of a phalarope, so you’ve introduced me to a new bird today!